Are you dreaming of a transparent network? The amount and complexity of the data stored in a Configuration Management Database (CMDB) is enormous. When you perform an inventory scan of your IT environment, large quantities of detail data consequently need to be retrieved per system. Preparing or aggregating this data into clear-cut display formats is a tremendous task which – if it was to be performed manually – would require too much time and money. 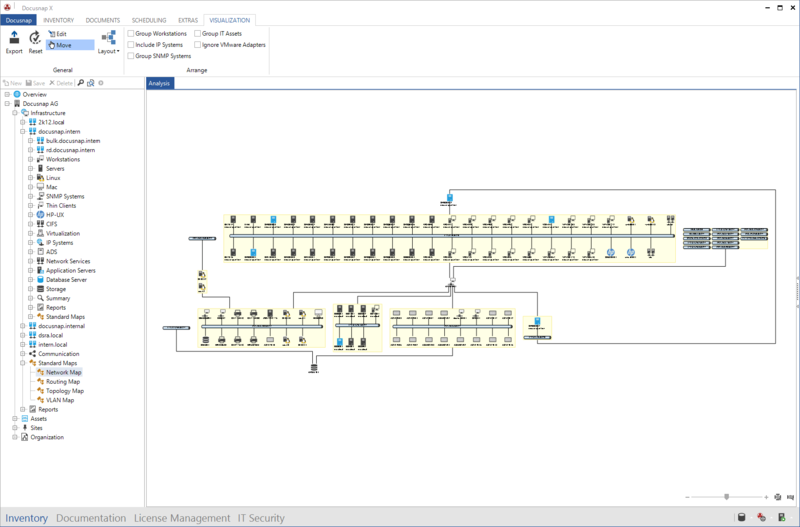 In practice, Microsoft Visio is quite often used for visualizing inventoried data. While this is a first step in the right direction, the data still needs to be transfered manually to Microsoft Visio and arranged there. Docusnap resolves this problem in a much smarter way: Following a comprehensive inventory scan of the computing environment, Docusnap offers various automated solutions which in no time provide you with an optimum overview of the network. 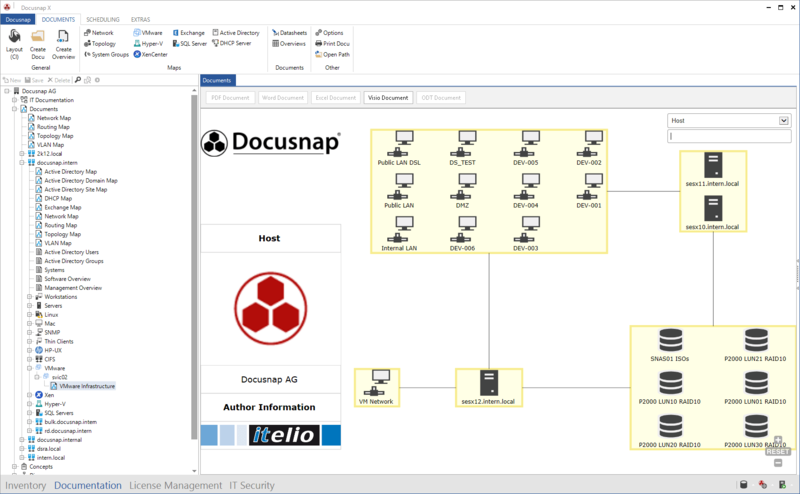 Docusnap automatically creates a variety of plans and diagrams, such as network plans, topology plans (cabling), Active Directory plans, plans for Microsoft Exchange, for group memberships, etc.). 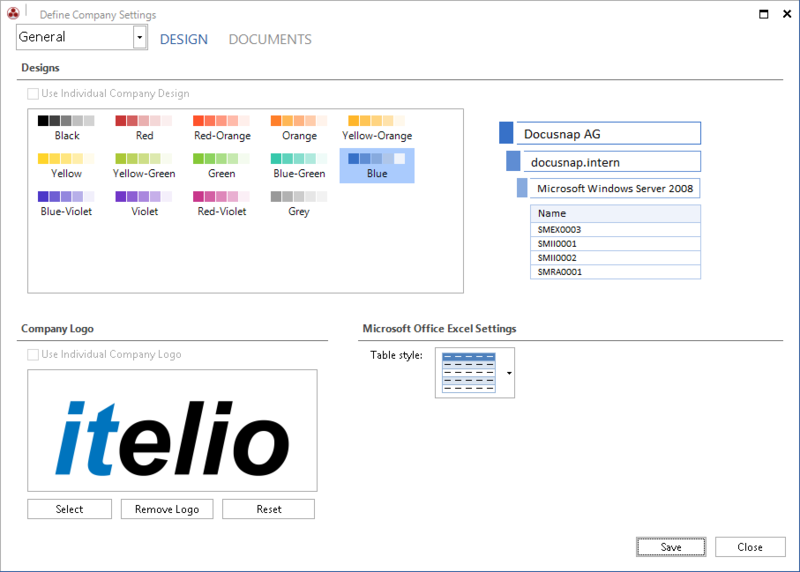 These Docusnap plans can be exported to many external formats, such as Microsoft Visio or HTML. It goes without saying that you can subsequently use Microsoft Visio to edit all plans created by Docusnap or add items to them manually. Sophisticated layout algorithms ensure that the individual items are arranged quickly and properly, while reducing line intersections to a minimum. Users may modify the layout algorithms as desired. Before data output, you can edit the plans manually or manipulate them to accommodate changed positions or groups. If the plans or reports are interdependent, the plans include drill-down functions for linking to the respective detail data. 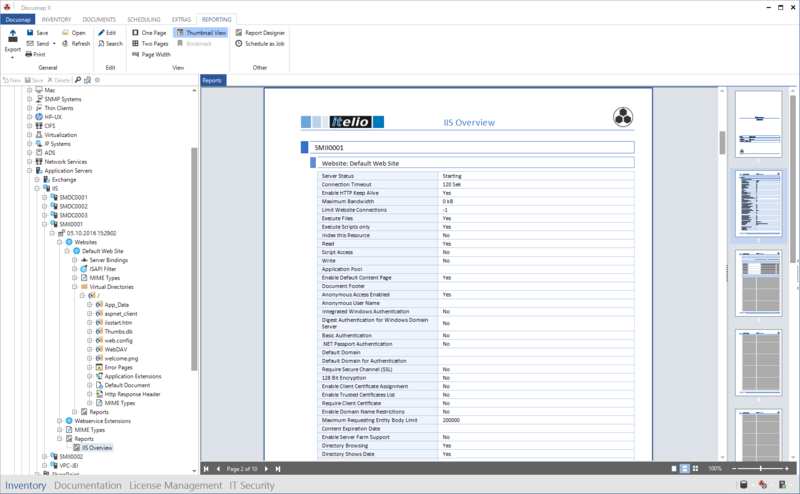 In addition to the graphical plans and diagrams, Docusnap provides countless predefined reports, enabling the easy creation of datasheets or diagrams. To ensure a consistent appearance, you can of course customize Docusnap to reflect the CI of each tenant or company. A few mouse clicks are sufficient to implement the changes centrally. Afterwards, all plans and reports use the newly defined design. 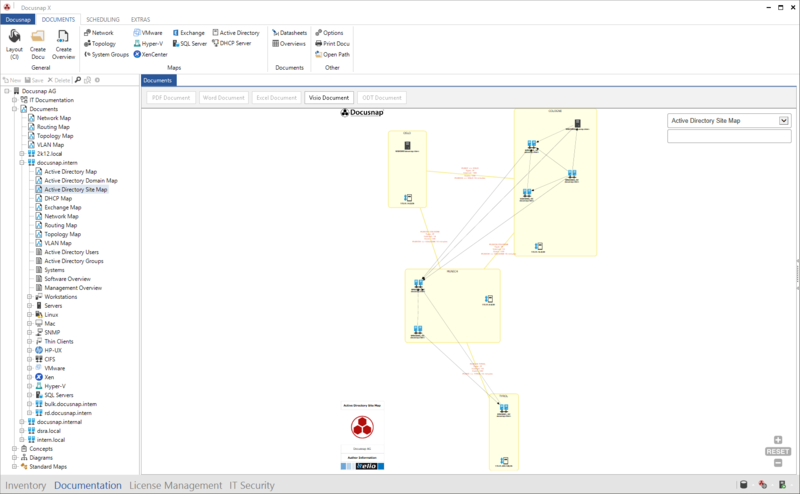 All plans, reports, and diagrams can be embedded easily into most various IT concepts. 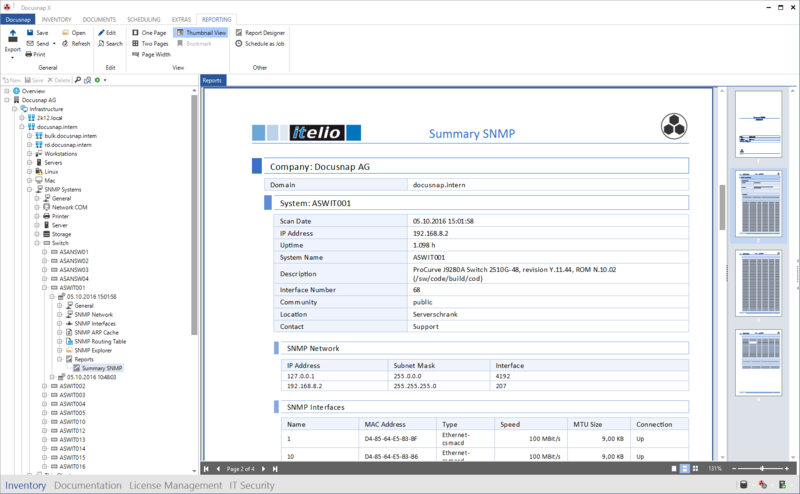 If you want the values in the concept to reflect any changes to the data saved in the CMDB after each new inventory scan, you can configure Docusnap to update the embedded plans, reports, or diagrams automatically. The analysis features in Docusnap allow you to create diagrams interactively. This makes it easier to get the overview you need, e.g. for detecting errors. 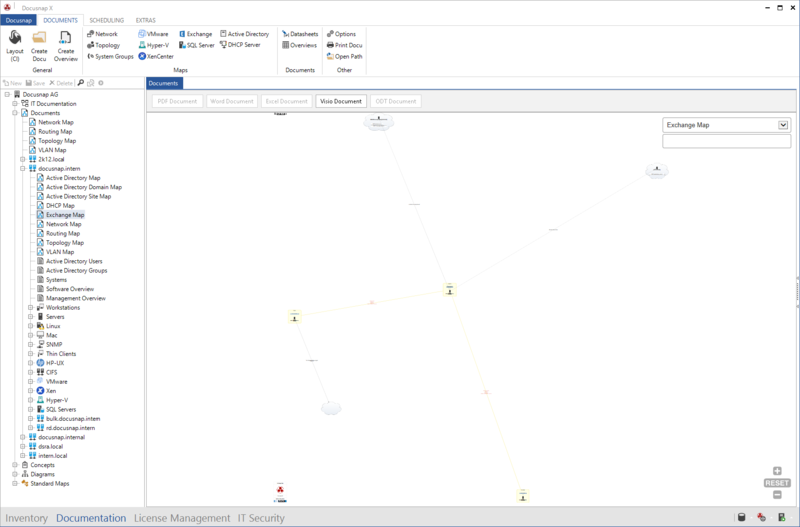 Of course, relations within the ITIL-compliant CMDB can also be represented graphically.